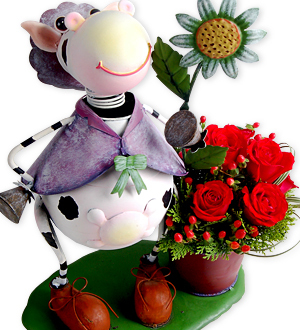 Duffy, the Garden Cow will show you the right way to a person's heart. She is a unique garden metal sculpture that will surely make most home homey and welcoming. Comes with a bevy of Red hot roses and berries, Garden Duffy is set to make your friend and loved ones' heart a flutter. We only uses imported Grade A++ Roses for all our arrangements. Duffy measures a staggering 46cm in height and can withstand warm and wet Malaysian's tropical weather.